For centuries, the Chinese have known that green tea is chock full of health benefits - drinking green tea has, in fact, been an integral part of their ancient medical practice. Over the past few decades, many of these benefits have been scientifically proven with hard evidence through a number of research studies. Green tea owes its potent medicinal properties and health benefits to a powerful group of compounds called polyphenols. One particular group of polyphenols, called catechins, is the most beneficial, and makes up almost 30 percent of dried green tea leaves. It is especially rich in the catechin called epigallocatechin gallate (EGCg), which is considered the most significant active component in green tea. EGCg is a chemical that is unique to tea - no other plant is known to contain this powerful compound. It has been associated with a number of medicinal and health benefits. In addition to its antioxidant benefits, a number of clinical studies have also found that the EGCg in green tea not only helps to lower the incidence of cancers, but also fights cancer when it occurs, reducing the severity of this devastating disease. Research conducted at Tokyo's National Cancer Institute showed that, consumed in sufficient quantities, the catechins in green tea reduces the incidence of cancer by more than 50 percent. Their findings have been linked to the fact that the Japanese customarily drink two to three cups of green tea a day, and have a lower incidence of cancer. A recent study conducted by researchers at Purdue University found that EGCg inhibits the growth of cancerous cells, helping to slow down its progression. These finding were supported by similar research in Spain (University of Murcia), and in Norwich, England (the John Innes Center). Researchers have determined that the mechanism by which EGCg works is very similar to that of methotrexate, a widely used anti-cancer drug. Both EGCg and methotrexate attack cancer cells, by binding with the enzyme dihydrofolate reductase. A unique feature of green tea's anti-cancer properties is that it has fewer side effects, because it kills cancer cells, without doing harm to healthy tissue. EGCg is one of the most powerful, naturally occurring antioxidants available known to man. It is, in fact, almost 20 times more powerful than Vitamin E. Antioxidants are indispensable in helping to counter the harmful effects of free radicals in the body. Free radicals are reactive oxygen molecules, which are created from normal body functions, and which greatly contribute to chronic disease and the aging process. Researchers have been able to resolve what has long been touted as the "French Paradox." Although the French in general consume a relatively fat-rich diet, they still have a much higher level of heart health than Americans. This has since been has explained by the fact that the French also consume a lot of red wine, which contains the compound resveratrol. Resveratrol is a polyphenol that help limits the harmful effects of a fat-rich diet, and which is responsible for the "French Paradox". A 1997 research study conducted by the University of Kansas found that EGCg is, in fact, twice as powerful as resveratrol, and thus even more effective than red wine in boosting heart health. It is also believed that this effect explains why the rate of heart disease among Japanese men is relatively low, despite the fact that almost 75 percent of them smoke. One European study documents a 36 percent reduction in the risk of heart disease among people who regularly drink green tea. The study credits this effect to the high content of polyphenols in this beverage. An 11-year long Japanese study of over 40,000 green tea drinkers demonstrated a considerable reduction in the number of deaths, resulting from cardiovascular disease. Over this period of time, participants who drank at least five cups of green tea a day had a 16 percent lower risk of dying from heart disease as those who drank less than one cup of green tea a day. The Japanese researchers have proven that green tea helps lower the levels of "bad" cholesterol or LDL, while increasing the level of "good" cholesterol (HDL). In this way, helps boost the ratio of good cholesterol (HDL) over that of bad cholesterol (LDL). Preliminary research indicates that EGCg helps inhibit the activity of platelets, the clotting agents in our blood. This is an essential benefit in the prevention of heart attacks and stroke, which result from thrombosis - the abnormal formation of blood clots in the arteries. Few other drinks have been credited with having as many health benefits. 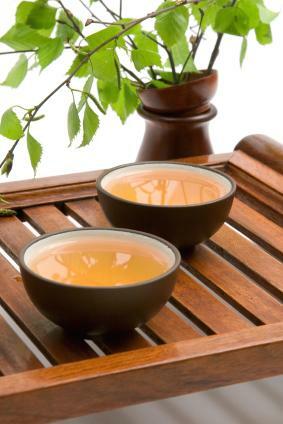 Drinking at least one cup of green tea a day will add more to your life than mere refreshment.